Did you have a chance to witness the first ever CTI Challenge? 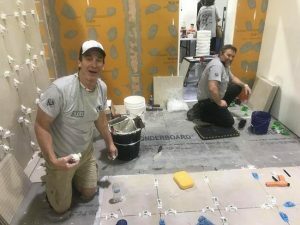 It took place during Coverings 2018 in the Installation Experience space, pitting two intensely passionate Certified Tile Installer teams to complete an ambitious installation over three days. The installation had to meet tile industry standards and guidelines. What was the CTI Challenge? 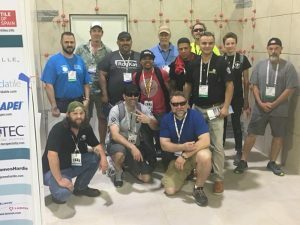 The “CTI Challenge” was a live event designed by CTEF training and certification director Scott Carothers, and took place between rival teams who are both NTCA members and Certified Tile Installers. The layout was as follows: The 20” x 20” tile was installed on the floor in a straight pattern which continued up two walls to a height of 8’. 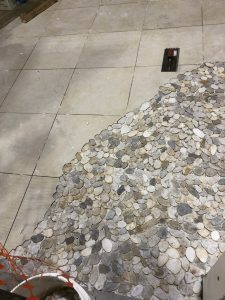 Within the floor, the plan called for the pebble stones to create a lazy river that connected at the doorway (which remained closed during the tile installation) to the other team’s layout providing a common river flow through both areas. Combining the pebble stone with the floor tile required very intricate and labor-intensive scribing onto the floor tile. The difficult part of this process lies in the ability to cut the rounded and oval shapes accurately into the large floor tile. Likewise, the stacked stone on the walls required similar scribing skills to connect it seamlessly to the surrounding tile. Products included: Daltile 20” x 20” Veranda Dune # P527 Porcelain Tile, #DA06 Creamy Sand Pebble Stones, and # S703 Haikou Grey Stacked Stone. All grouted with Custom Building Products Polyblend grout # 386 Oyster Grey. Substrate products included WonderBoard by Custom Building Products and KERDI-BOARD by Schluter Systems. Timeframe: Beginning Monday, May 7th, each team conducted its own assessment of the wall and floor substrates and executed the necessary corrections using trowel-applied patch. KERDI-BOARD was used as the wall substrate while WonderBoard was used on the floor. The Challenge took place on Tuesday, May 8th and 9th. After the teams completed the tile work, the construction fencing and blocked doorway were removed to allow Coverings attendees to view the beautiful and high-quality workmanship of these tile artists. Alena Capra of Alena Capra Designs provided design assistance and material selections. How did the CTI Challenge demonstrate the work of Qualified Labor? Both floors and walls complied with ANSI Specification A108.01 – 2.6.2.2. These four craftsmen demonstrated the truest sense of Qualified Labor as defined in Tile Council of North America Handbook. Qualified Labor and true artistic talent combined to provide Coverings attendees with a fine example of tile installed as it should be. Who participated in the first ever Challenge? Two teams of two expert installers participated. All four were Certified Tile Installers and active members of the National Tile Contractors Association (NTCA). What sparked the idea of a CTI Challenge? Definitely a strong competitive spirit, friendly rivalry and great pride in tile workmanship! Not to mention a great deal of enthusiasm that both teams shared in the Global Tile Posse Facebook Group. Jason McDaniel was thrilled when Scott Carothers took the idea seriously; he was ready to do something cool. Since there wasn’t enough time to work out the logistics of the challenge for TISE18, the Challenge was moved to Coverings 2018 and incorporated into the Installation Experience Hall of Excellence. Expect the Unexpected in a CTI Challenge! The two teams arrived at Coverings 2018 without a single idea of what to expect for the challenge. Jason envisioned an over-sized CTI hands-on test to specific methods and standards. Neither team expected a 20-foot pebble-scribe installation to be completed in three days! Greg explains, “Once Scott was on the task, it was all too clear to me that the unexpected was to be expected. So, I prepared by not preparing. There is no point to over think the situation that is an unknown. The scale of the project was a little ambitious so once we all realized the scale should be paired back we did as in any normal good team project going on across America. We talked openly about the best solutions to get it paired back and keep it moving so we could finish in the 3-day time frame. We completed as much as we all could within that framework. That was the success of this Challenge: the work itself not so much the full completion of it. As you can see these photos, the workmanship was outstanding! It generated conversation, awareness and awe. Crowds asked about the pebble stone scribing process . Some thought it was ordered already cut and ready to install, but of course it wasn’t It was all custom-cut and fit on site. Other attendees asked about the lippage control systems, trowel sizes, and grouting techniques being used. They were eager to interact with both teams. And the Best Part About Participating in the CTI Challenge? Greg Twarog says: “The best parts were where I did slow down and stop to talk with passersby about how do you do that, or what are you doing there . It was as if we were installing in a home or business and someone was stopping to ask a question that, if they had been at home, they may not have asked. And that is true enlightenment for some people. They then understand that the lines on the walls have a purpose; the trowel size is important to get proper adhesion, or the lippage control clips keep the tiles into plane with one another to limit the Lippage that’s seen in the large format tiles. It was those moments that were most enjoyable to me. Aside from ribbing Jason and Shon of course! Who won the first ever CTI Challenge? Judges Mark Heinlein and Scott Carothers agreed that this first ever CTI Challenge was a draw. Both teams worked tirelessly to create great installations! They set a new standard. Greg adds, “I hope this will be a continued challenge to be celebrated year after year at Coverings. What better tribute is there to our industry than to invite CTI challengers to go to our leading industry event and show how they install using their industry knowledge and craftsmanship in a public group setting. Thank You, CTI Challengers 2018! 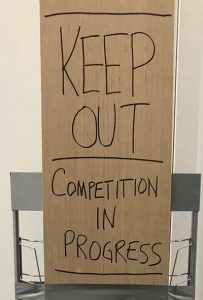 And thank you to all who came by to encourage the challengers, witness the challenge, celebrate when it was over and generally be amazed by the work they completed. Here you see many of the top tile industry installers and fans posing with the CTI Challengers of 2018. What’s your reaction to the first ever CTI Challenge? Did you enjoy what you saw? Are you ready to be challenged? This story was taken from the CTEF Blog. 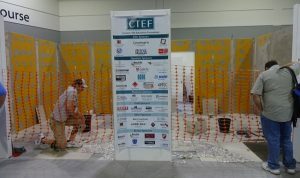 More information on CTEF can be found by visiting their website at www.ceramictilefoundation.org or visiting the CTEF Blog by clicking this LINK. Spring is in the air so that can only mean one thing…it’s time for Coverings. For those of you attending the show, why do you attend? What are you planning to take away from the show? If you are like several people that I have talked with, you are attending to network, learn about new products, and attend several of the educational events to help your business grow. So obviously it is important to you to keep up with current trends and education opportunities. Do you also have your employees with you or are they all at home working? Unless you are local to Atlanta, I’m guessing that all of your employees are at home because of the travel expenses to attend. When you go home, what do you do with everything that you learned at Coverings? Do you discuss what you learned with your employees or do you just go on with business as usual? Even if you don’t discuss what you learned at Coverings, have you thought about purchasing access to NTCA University to offer training to your employees? Several people have mentioned they just don’t know if it’s worth it to them to offer training to their employees. If you have taken the time to seek out additional training for yourself, you owe it to your employees to enrich their learning too. Maybe you’re unsure if what we offer on NTCA University is right for your company. Given that so many of our members have questions about courses offered and how to use the site, I will be available at scheduled times at the NTCA booth #8209 at Coverings. Check the booth daily for times when I will be there to discuss anything associated with NTCA University. If you have an opportunity to spend time in the Installation Experience, you will be able to see varying skill levels of installers that you are competing with today. Would you rather be the installer of a really bad installation with lots of call backs or would you rather be an installer like the qualified labor installation? All of the NTCA University courses are based on industry standards and help you grow your knowledge. If you are unable to attend Coverings but you want additional information on NTCA University, please give me a call or send me an email. I would be happy to discuss the training opportunities available with you. Reach me at 770-366-2566 or [email protected] To purchase your subscription, you can visit the NTCA store at https://tile-assn.site-ym.com/store/ListProducts.aspx?catid=490398 or http://bit.ly/2taYmOO to make your purchase. 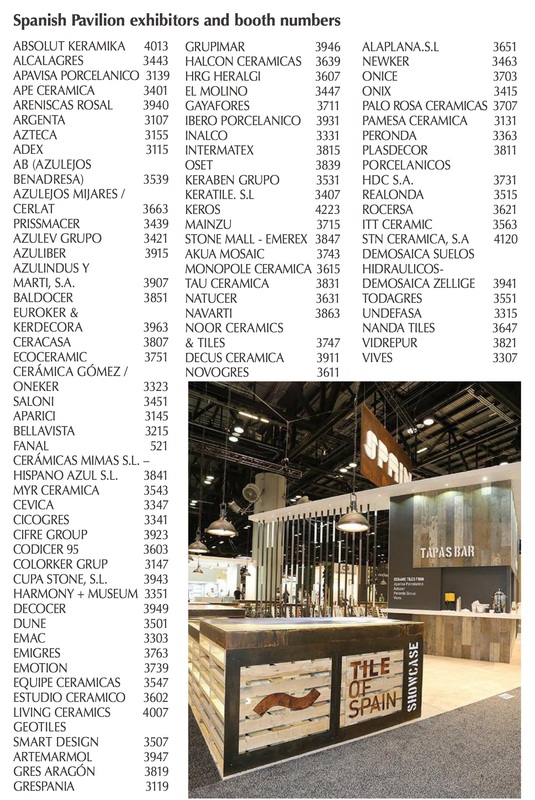 Tile of Spain, the international brand representing 125 ceramic tile manufacturers belonging to the Spanish Ceramic Tile Manufacturers’ Association (ASCER), is ready to “wow” Coverings 2018. 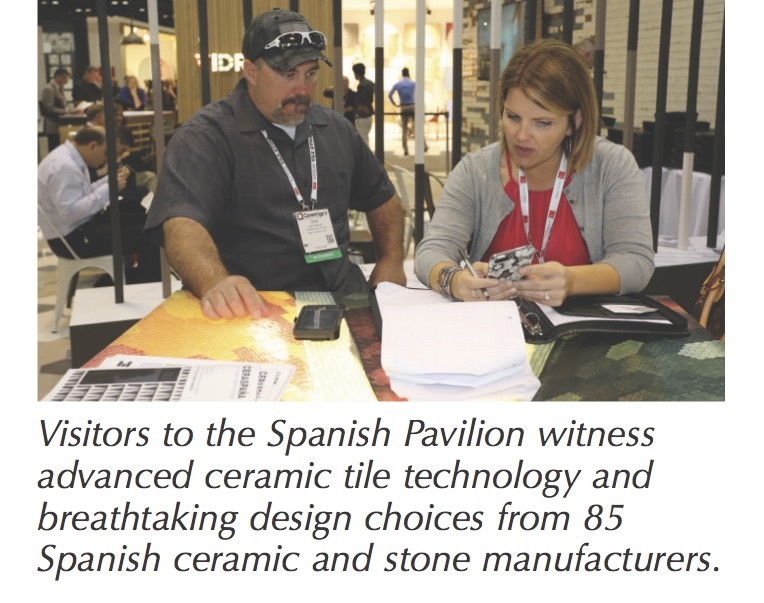 Visitors to the Spanish Pavilion will witness some of the most advanced ceramic tile technology and breathtaking design choices the world has to offer from 85 Spanish ceramic and stone manufacturers. The Tile of Spain booth (# 3718), in the center of the pavilion, holds a variety of literature, including directories to the must-see Spanish tile exhibitors and the latest issues of Ceraspaña, Tile of Spain’s quarterly magazine. When you think of trends, the tendency is to think macro – big picture. What sizes, designs and colors are trending this year? But that’s only one side of the story with a rapidly innovating industry. As the industry moves into a mature phase of digital technology, the colors and designs we use in ceramics this year are only the prelude; the really interesting things that are happening in ceramic design are the seemingly small augmentations that enhance the whole so much more than can be imagined. In a world where we can print any picture we want on a tile, how do you differentiate your tile from the competition – how do we make our products unique and harder to be value-engineered? Join the Tile of Spain pavilion to explore the macro trends, and then dig deep into the broad array of micro tools that creative directors can employ today to create the most effective and layered looks the world of ceramics has ever seen. Purchasers, sales people, specifiers and end users alike should all find valuable takeaways from this session as they become sommeliers of tile by learning to distinguish the multiple layers of modern design and production techniques in ceramics. Tile formats continue to broaden the array of options and suitable applications for tile. Many of these new formats can add significantly to a building’s overall performance, resource-efficiency strategy, occupant health and safety, lowered operating and maintenance costs and overall lifespan/sustainability of the property – but only if the decision to use tile for a given area or purpose is made during the preliminary/structural design stages. Further installation costs, prep-work requirements and even the suitability of the intended product for the task are becoming more and more dependent on proper space configuration, construction methods and spatial dimensions so early selection of tile is key to adoption rates. 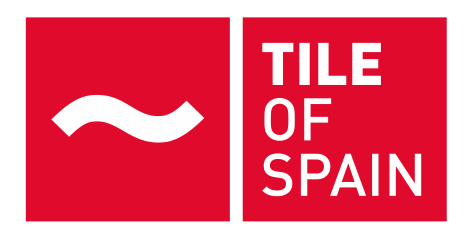 Participate in this session at the Tile of Spain pavilion where key tips and tricks to getting the most out of tile in your buildings today will be revealed. 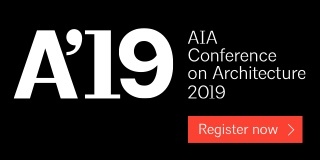 As a supplement to the conference session “Skin vs. System,” the program will explore sales channels, specification practices, and material selection models that can make the use of tile the single most important and impactful aspect of your next project. Tile of Spain will host an extended Happy Hour on Tuesday, May 8th from 4:30 pm to 6:30 pm., during which a special session will take place with an opportunity to “Talk to the Expert” about tile specification, trends and more. 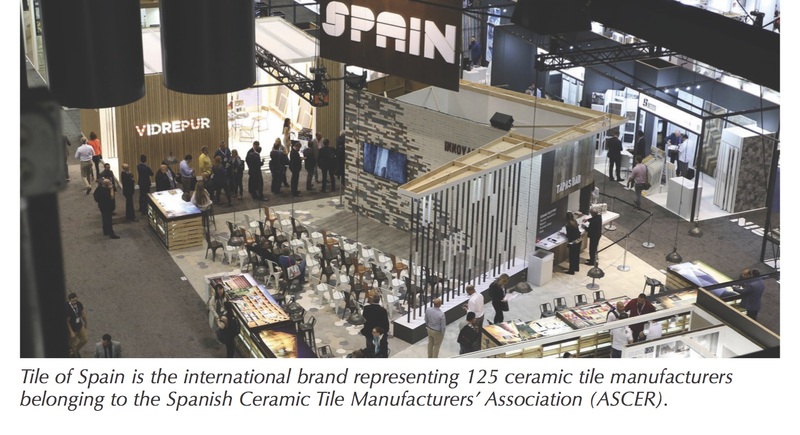 Once again, ASCER, the Professional Association of Ceramic Tile Manufacturers from Spain, and ICEX Spain Trade and Investment organize the 2018 Spain Pavilion. For more information, contact [email protected] or visit tileofspainusa.com. SkillsUSA competitions for tile setting: coming to a state near you soon? 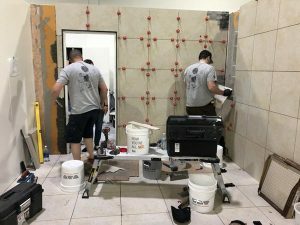 In March at the Construction Education Foundation of Georgia (CEFGA) Career Expo, tile setting was once again part of the SkillsUSA competition. That fact is largely due to the persistent efforts of Rod Owen of NTCA Five Star Contractor, C.C. Owen Tile of Jonesboro, Ga., for pushing to get tile added to the SkillsUSA line up. Prior to the first competition, Owen worked with a team of local manufacturers and contractors to put together a study guide, exam questions, and test module. Information was then forwarded to high school construction programs that participate in SkillsUSA. The first year of the competition, there were five competitors. None of these students had extensive knowledge of setting tile – some of them had been setting tile for two weeks, while others started at the beginning of the semester, but none had ever set tile on an actual job. While all of the tile patterns didn’t exactly match the layout the students had been given, all of them finished quickly. Owen and team went back to the drawing board to develop a larger and tougher hands-on test for the second year. This time, 12 students registered but only 10 competed. These students ranged in knowledge from newbies who had never set tile to “veterans” who had competed last year and honed their education for a year. 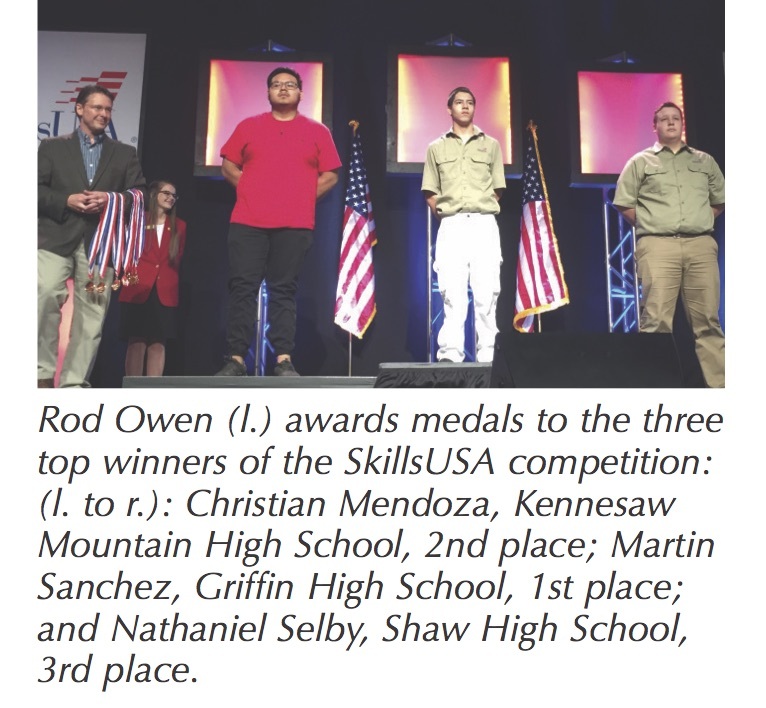 As Owen and his team look toward the third year of competition, the desire to expand this SkillsUSA competition into other states is growing. Why should anyone in the industry care about what is going on in Georgia? Owen said it best. “I have a high level of respect for the industry that we are in, and a high level of respect for those true craftsmen that represent our industry in a positive way on a daily basis,” he explained. “We owe it to these industry professionals – including ourselves – to market our industry in the same manner that other reputable trades do; to not have a national tile competition is a discredit to us all. If we expect others to take an interest and have passion for our industry we must first show and exemplify that passion ourselves. At this year’s awards ceremony, Owen and I had an opportunity to speak with Tim Lawrence, Executive Director SkillsUSA, to learn about expanding the competition to a national level. We learned that for tile to be added to the national competition, we need to have 10 states facilitating the tile setter competition. Skills that are able to have 10 states represented at the national level are put on probation for two years to ensure that the competition is able to bring in competitors from these different states. While working to get tile setting recognized by other states to get to national recognition, we can petition to have a technology demonstration at a national competition to showcase the test and potentially get other states interested in offering the new competition. Since Coverings is in Atlanta this year, Owen was able to work with show management to showcase the test module that won at this year’s SkillsUSA competition. While presenting this to attract interested contractors, we’re also hoping that what’s being done in Georgia will spark other contractors to work with the tile industry in their market and start their own SkillsUSA tile setting competition. If you want to get involved, know that there is existing test material developed that interested contractors in other states can use. We recommend working with a team of tile industry professionals to supply judges and the hands-on test supplies like tile, setting material, etc. Once approved, your state SkillsUSA organization will work with you to send information to prospective competitors and provide the space for the tile setting competition at a sanctioned competition site. If you are interested in getting involved with SkillsUSA, you can visit their website at http://www.skillsusa.org to learn more about the organization and to find your state representative. I’m also happy to help – contact me at [email protected] to learn more about what is being done at the state level in Georgia that could potentially be replicated in your state. For the 2018 edition of the Coverings show taking place in Atlanta, Ga., Ceramics of Italy will showcase a wide range of Italian tile products, as well as educational sessions and a celebration of the rich history of Italian tile in North America. The central point for the Italian pavilion will once again be Strada Dinamica, where visitors can learn more about the exhibitors and the initiatives the Italian industry is supporting to continue to promote the benefits and use of ceramic and porcelain tiles, grouts and more. Designed by New York firm e+i studio, Strada Dinamica (Italian for “dynamic street”) is the focal point of the Italian pavilion. Modeled after a lively Italian streetscape, the booth includes benches, standing communal tables and two large kiosks that house a cafe, coffee bar and information desk. Thoughtfully designed with every detail carefully planned in order to maximize space and functionality, e+i studio has created a welcoming environment among the busy convention center. Florim’s Magnum Oversize tiles and Lea Ceramiche’s large-format floor tiles are set on a raised flooring system by Newfloor, which showcases the products that are simultaneously displayed by exhibiting member companies in use. Visitors are invited to stop by the Ceramics of Italy booth (booth 1630, Hall B3) to learn more about industry initiatives including the Ceramics of Italy Tile Competition, celebrating its 25th anniversary this year, the new industry-wide EPD, and the Good Phytosanitaryware Practices program – implemented in collaboration with CTDA. 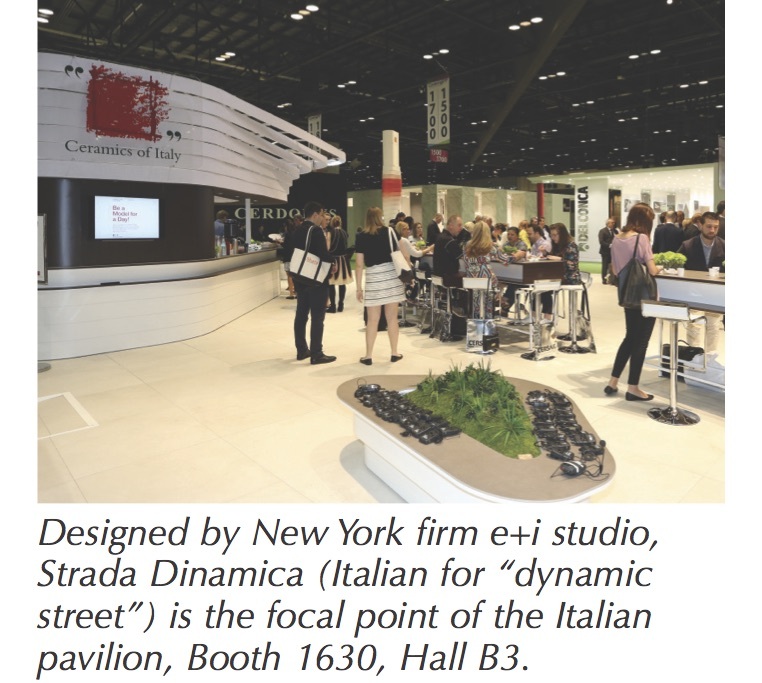 Strada Dinamica is also an excellent meeting point for attendees to enjoy an authentic Italian espresso or pick up a copy of the latest issue of Cer magazine and take a break from the bustling show floor. The Italian pavilion will be full of inspiration and innovation this year, as 100+ companies exhibit their latest collections, demonstrating their extensive understanding of architects’ and designers’ needs. Modern innovations such as large-format tiles will continue to be popular with expanding collections in 6 mm ultra thin and large collections that range from metal to stone and marble designs. Outdoor pavers and exterior cladding tiles will also demonstrate the multi-faceted approach to tile products that many Italian companies share. 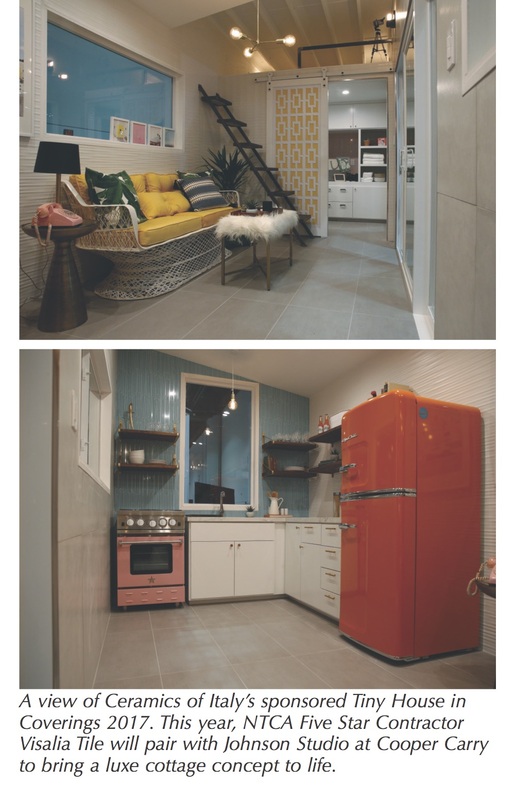 Companies also continue to expand upon popular trends like terrazzo and nostalgia-inspired tiles while others experiment with new techniques to create painted effects and combine categories of materials such as marble and wood looks in one design. Innovations and improvements to digital printing will be seen as patterns become more intricate and colors become richer. Examples of these advancements include botanical-inspired motifs and weathered looks perfected to capture a natural passage of time. The variety of trends shown within the pavilion are sure to impress and inspire visitors at the show. Along with Strada Dinamica and the exhibitor booths of member companies, Ceramics of Italy will host a number of special events and sessions during the show. On Wednesday, May 9 at 8:00 am in Room B312, sustainability experts including Andrea Contri, Sustainability Manager at Confindustria Ceramica, will tackle the multi-faceted issue of sustainability and how it is perceived today. It will also provide an in-depth look at how the industry can combine sustainability messaging and various specification tools into a package, which resonates in today’s sustainability landscape. 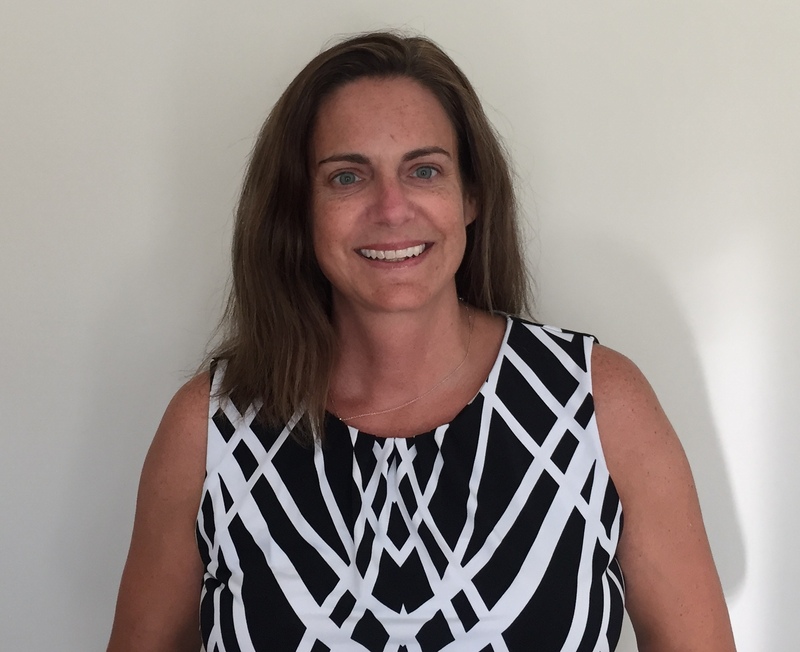 Afterwards, at 9:30 am in Room B309, Cristina Faedi, Manager of Promotional Activities for Ceramics of Italy, will discuss the latest tile trends, material innovations and creative applications along with other tile industry experts. Celebrating a special anniversary year, Ceramics of Italy will host a lunch and film screening on May 9 at 12:30 pm in honor of 25 years of the Tile Competition. Design and tile industry professionals are invited to a private Italian lunch and premiere of a film on the prestigious awards program, directed by Francesca Molteni and architectural historian Fulvio Irace. The short film will be followed by a panel discussion with past winners of the competition and a guided walking tour of the Ceramics of Italy Pavilion. 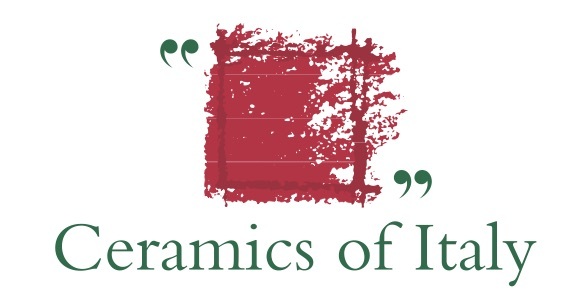 Ceramics of Italy is a proud sponsor of the Installation Design Showcase – an interactive exhibit pairing innovative products with creative design and expert installation. 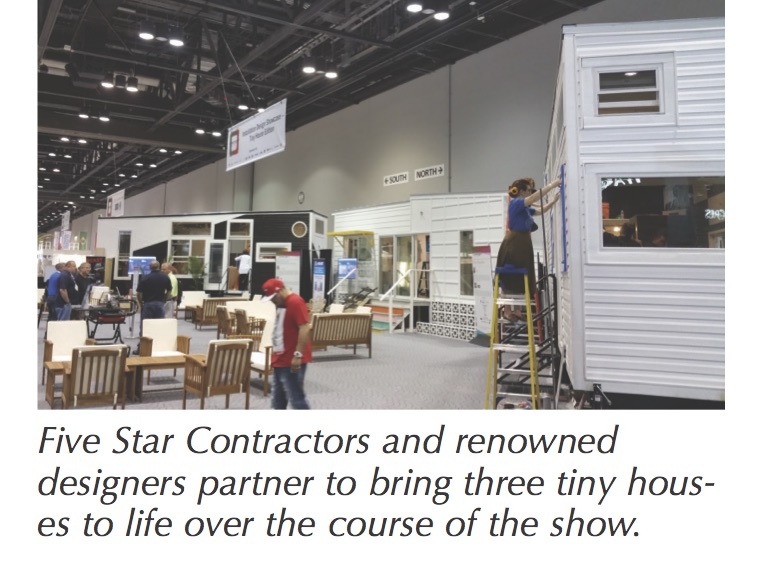 Attendees are invited to visit the Tiny House throughout the show where installers from Visalia Ceramic Tile will bring Johnson Studio at Cooper Carry’s luxe cottage concept to life. A wide range of Italian products will be used throughout the space, from wood-look tiles to rich blue tones with chic metallic accents, culminating in an intimate, rustic-modern escape. The installation will be completed by Thursday afternoon and members of the design and installation team will present the project during IDS: Deconstructed from 3-4 pm in Hall C, Booth 8804. Throughout the show floor the “Made in Italy” trademark indicates products that are defined by high aesthetic quality, durability, and environmental responsibility. For those who can’t make it to Atlanta, Ceramics of Italy will post live updates on Facebook (@CeramicsofItalyNA), Twitter and Instagram (@CeramicsofItaly). For more information about the Italian tile industry, visit the new website of Ceramics of Italy at www.ceramica.info. Coverings is the greatest tile and stone show in the western hemisphere, and CTDA is the only organization here that connects, educates and strengthens tile and stone distributors. A Total Solutions Plus (TSP) 2018 giveaway. You can register as an attendee for TSP at the booth too! Also on Tuesday, May 8, CTDA will conduct a CCTS Certification exam, with at least three potential CCTSs taking the test to be certified. The Study Guide for the exam is also available as an online education course, created in conjunction with the University of Ceramic Tile and Stone (UofCTS) for people who are preparing to take the CCTS test. Stop by CTDA Booth #7832 on Tuesday evening for Happy Hour! Enjoy a special drink from CTDA. The CTDA 2018 Supplier of the Year will be announced Tuesday evening as well. CTDA and its distributor members value the importance of supplier relationships so, annually, CTDA distributor members recognize the supplier who provides the most value to CTDA distributor members and the ceramic tile and stone industry by awarding them The CTDA Supplier of the Year Award. CTDA’s distributor members take a survey, rating up to three suppliers each on the following criteria: leadership, marketing, training, technology, communication, policies, and product shipment and support. 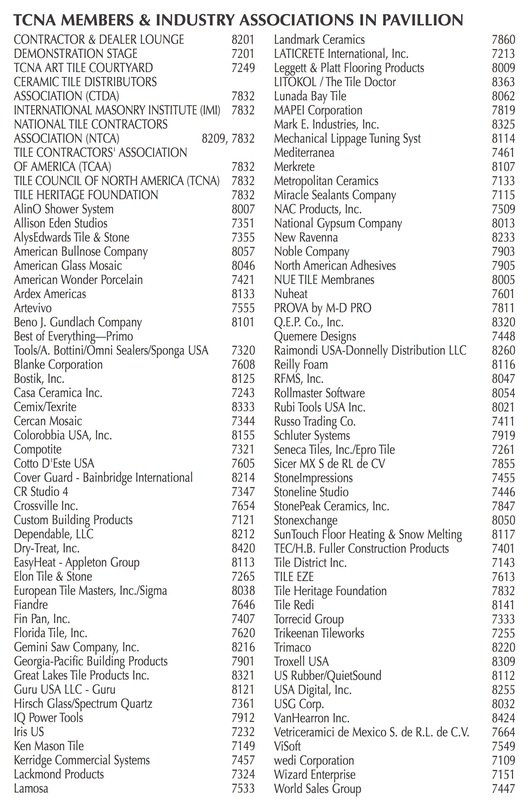 Past recipients include industry leading companies such as Florida Tile, Crossville, LATICRETE and MAPEI. During the show stop by CTDA’s Booth # 7832 to learn about member benefits and if you aren’t already a member, fill out an application. Applications are also accepted online here: www.ctdahome.org/content/membership/application.asp. Card Connect, a credit card processing company whose services are available to CTDA members at deeply discounted prices. Companies have seen savings of 10% to more than 50% on credit card processing fees when switching to Card Connect. Human resources and benefits solutions through Insperity. Insperity offers many products and services including: Payroll, Time and Attendance, Recruiting Services, Retirement Services, Financial Services, Performance Management and more. PartnerShip helps CTDA members save money on every inbound, outbound, small and large shipment. PartnerShip not only provides excellent savings to its clients but also provides a complete managed solution for shipping Less Than Load and Full Load shipments. CTDA members can receive major travel savings through complimentary access to MyPlanITraveler, a travel membership site that provides wholesale pricing on hotel stays, vacation resorts, car rentals, cruises and travel activities. The CCTS Program for professional ceramic tile salespeople. CTDA Membership has many additional benefits including access to Educational Webinars, discounted online education through UofCTS, Tile Training in a Box – a shade variation program that uses graphic representations of each variation along with full-color photographs of actual tile installations – networking through Total Solutions Plus, committee involvement or small groups. For information on all member benefits, visit the CTDA website: www.ctdahome.org/content/membership/benefits.asp. Stop by booth #7832 to register for Total Solutions Plus 2018. Over 650 attendees took part in the networking, educational sessions and keynote speakers that Total Solutions Plus 2017 offered and another recording-breaking year is expected in 2018. The purpose of Total Solutions Plus is to annually bring the ceramic tile industry together to network and learn from each other. 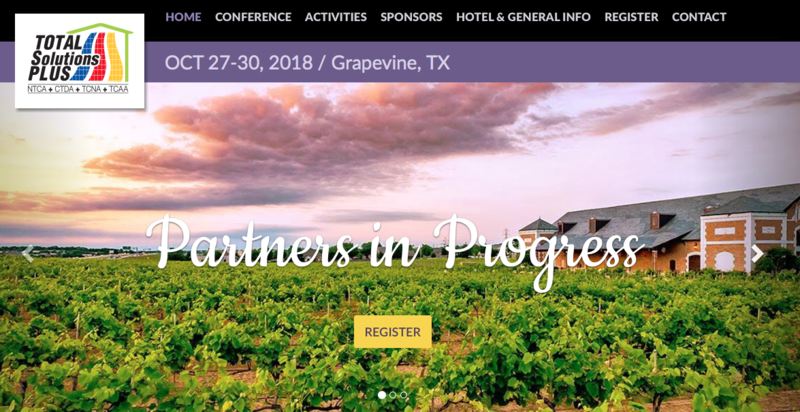 This year Total Solutions Plus is October 27-30, 2018, at the Gaylord Texan Resort Hotel & Convention Center in Grapevine, Texas. Experience thrilling keynote sessions, engaging breakout sessions, receptions and tours to enhance networking experiences with your peers and business partners in the tile industry. Follow CTDA on social media. • LinkedIn: linkedin.com/groups/1937152 as Ceramic Tile Distributors Association. • Facebook: facebook.com/Ceramic-Tile-Distributors-Association-CTDA-268340616510423/ as Ceramic Tile Distributors Association (CTDA). This paper was recently presented at the Qualicer ’18 conference in Spain. The use of polymer/latex type additives that improve the performance of thin-set adhesives and mortars has been in common and increasing use since the 1960s. For decades there have been occasional references to some of these polymer/latex additives leaching from tile work to cause problematic stains on the finished surface. As a consultant looking at problems with tile-work over the decades, I have noticed an increase in this specific staining, called “latex leaching” that is sometimes confused with “efflorescence” staining. This staining is far more difficult to treat than efflorescence, but it is easier to avoid. Investigations into this staining have revealed certain changes in products and procedures that are associated with this increase. This paper does not analyze the chemical aspects of the cause of this staining; rather it explains actions that can be taken by designers, specifiers, builders and tile installers to avoid this problem. While some minor whitish deposits are likely to come from excess water in the grout mix, the serious disfigurement that keeps returning and which is identifiable by having a clear, sticky component that has a characteristic acrylic odor, is from water under the tile, that carries uncured additive to the grout joints. See photos 1, 2 and 3. There has been a world-wide uptake of large-format tiles. 35” x 35” and 48” x 24” porcelain tiles are now commonplace, and the use of “thin tiles” such as Laminam and Kerlite are increasing. These tiles generally have less than 0.5% water absorption, and so water in the adhesive is not taken into the tile back as occurs with twice-fired tiles. These large tiles are usually laid with narrow joints, usually between 1/16” to 1/8.” This means that moisture in the adhesive is very slow to move to the evaporation point at the joints. This results in slower drying times and slower curing times for the adhesive. More latex and polymer additives are being used because they are necessary for adequate bond strengths to be attained when dense tiles are used. On top of this, the range of adhesive additives has been changing to include water entrainers and retarders, which can slow the cure of the adhesive. While “thin tiles” (aka gauged thin porcelain tiles or slabs) are installed using smaller notched trowels, it is general for tiles greater than about 24” x 12” to be laid using 1/2” notched trowels, with adhesive manufacturers usually calling for a minimum 1/8” depth of adhesive and 100% contact coverage. Most manufacturers of adhesives also call for large tiles to be “back-buttered” with adhesive, and this adds to the depth of adhesive coverage. Some contribution to thicker adhesive layers also comes from unskilled tile installations and other construction trades’ workforce. If surfaces are not true and straight, then extra adhesive is required to pack the finished work out to its proper alignment. Preparation trades who fail to provide good surfaces – or tilers who have poor mortar screeding skills – end up using thicker adhesive layers. For a number of reasons, including efforts to prevent efflorescence staining, there has been an increase in the application of waterproofing membranes over the top of mortar screeds. Often the aim is to prevent water entering the mortar screed and leaching calcium stains out. Such a waterproof membrane prevents moisture in the tile adhesive from being absorbed into the screed, thereby delaying curing and drying of the adhesive. The increased use of other dense layers over the screed, such as uncoupling, or crack-isolation membranes made of bitumen or plastics such as polyethylene, have a similar effect of preventing the absorption of water in the tile adhesive into the screed. All of the above changes result in slower curing and drying of the tile adhesive. For internal tiling, this is not a great issue. It means wall installations need to have supports left in place longer to reduce creep, until a proper cure has occurred, and floors should not be trafficked for a number of days, instead of the usual 24 hours. But when it comes to external tiling, this slow curing and drying can be a major problem. Despite this call for the manufacturer’s directions to be followed explicitly, a review of a large number of adhesive product data sheets revealed no mention of delayed curing when dense tiles and the adhesive were used over impervious substrates. The issues caused by this delay in curing and drying emphasize the need to specify and use rapid-setting adhesives for all tiling where a delay in curing is likely to cause problems. The problem of latex leaching is not widespread on external tiling. This proves that the adhesives, mortars and installation systems used are suitable and meet the needs of the industry. However, under certain conditions, some components of the latex/polymer modified adhesive leach out and cause staining. Investigations at more than a dozen sites with latex leaching in Australia revealed a common cause. All the instances occurred when rain fell on uncovered and ungrouted tiling. In one apartment complex, rainfall charts and construction diaries were used to show that the four tiled decks that were suffering latex leaching were all exposed to rain before they were grouted. The six unaffected decks at the complex were grouted before it rained. The lifting of tiles during investigations almost a year later revealed water still trapped in the ribs of tile adhesive. These decks have an acrylic waterproofing membrane applied over the screed. Often, the residual water had caused the tile adhesive to discolor. This discoloration was present where water had access to the grooves in the adhesive, but was not present where the adhesive rib was closed off. Clearly, grouting the tiling helps prevent latex leaching, since even though the grout would allow some moisture to pass, it appears to prevent rainwater from filling the grooves in the tile adhesive. It appears that this liquid water extracts uncured latex or polymer from the day-old adhesive. 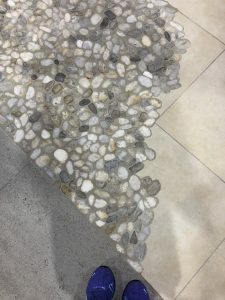 The movement of moisture under vapor pressure, particularly when sunlight warms the tile surface, takes it to the surface of the grout joints, where, on evaporation, the residues are deposited. The same applies for wall tiling applications: grouting soon after installation is important in the prevention of water entry. If the wall has an open top, such as a fence or balustrade, it is important to seal the top, possibly with a capping, to prevent water entry. So, while water entry into ungrouted tiling may not be the only cause of latex leaching, it is certainly a major contributory factor. While latex leaching has occasionally been mentioned in professional tile journals for over 30 years, it’s more plentiful today due to changes that have occurred in tiles, tile installation, and construction. These changes include the combination of larger, denser tiles, increased use of latex/polymer-modified mortars and thin-set adhesive, and greater use of membranes and crack-suppression systems under tiles. Under these conditions, the modified cement products take longer to cure, and in some cases, much longer to cure. If ungrouted tiling is flooded, there is a far greater likelihood of latex leaching occurring, so external tiling should be grouted as soon as possible, to prevent wholesale entry of water into any voids under the tiles. This means covering the ungrouted work if there is any chance of rain. No instances of latex leaching were encountered when rapid-setting adhesive had been used, but the tiling should still be protected if rapid-setting products are used. 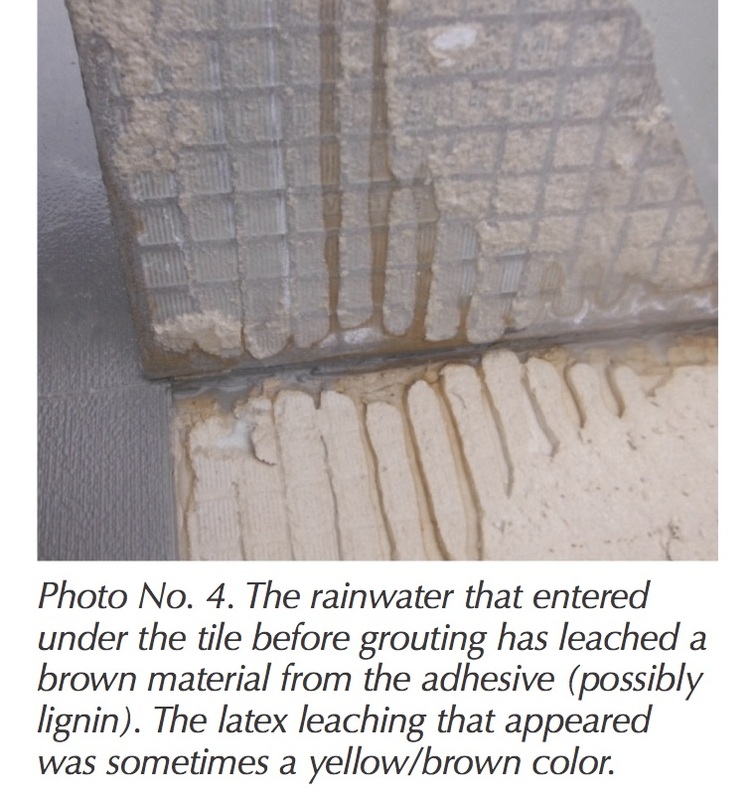 The information supplied by tile adhesive manufacturers is generally remiss when it comes to warning about likely delays to curing and setting times when dense tiles are installed over impervious substrates, and no information was found warning that latex leaching could occur if ungrouted tiling was flooded. More detailed information needs to be inserted into specification and instructions underlining the importance of protecting unfinished tiling from rain and flooding. If the tiling is inundated the wet vacuuming and adequate drying time must be allowed before grouting to avoid latex leaching. There also appears to be an opportunity for chemical engineers to test if some adhesive additives are greater contributors to latex leaching than others. This could allow for the development of superior external tiling adhesives that would be less likely to present with latex leaching. Tile Council of North America (TCNA) is an international trade association representing North American manufacturers of ceramic tile, installation materials, tools, and related products. This year, over 115 TCNA members are excited to showcase their latest offerings at Coverings in Atlanta. In addition to inventive tile designs, you can discover what’s new in the world of tools and machinery, as well as installation materials, all in the TCNA North American Pavilion. 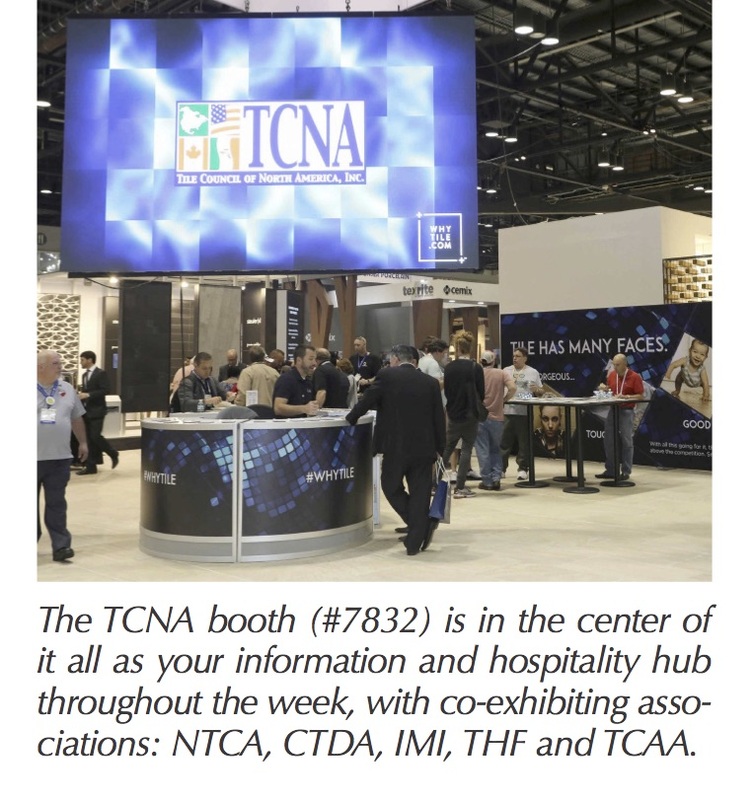 The TCNA booth (#7832) is in the center of it all as your information and hospitality hub throughout the week. 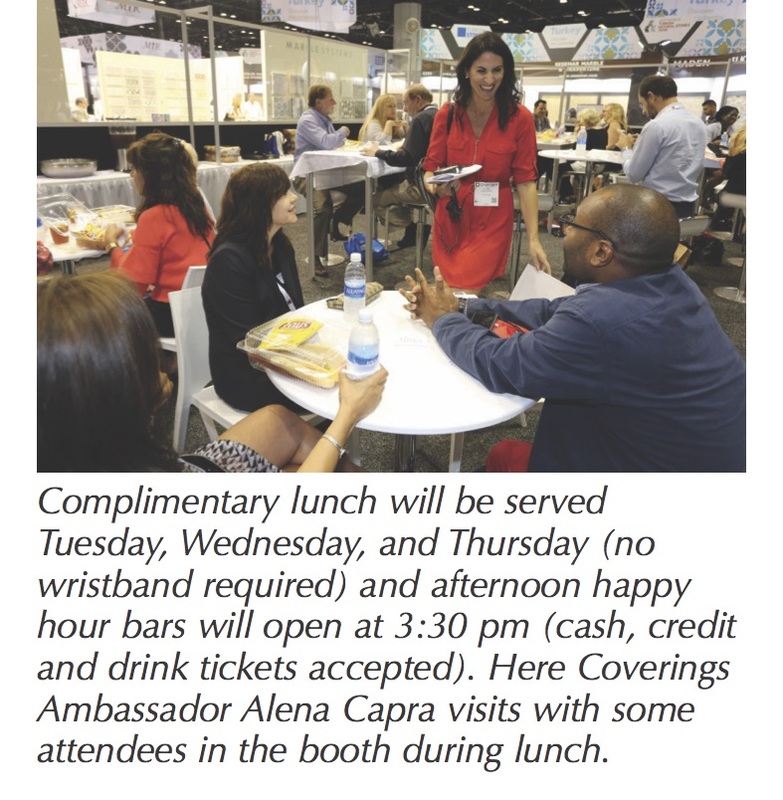 Complimentary lunch will be served Tuesday, Wednesday, and Thursday (no wristband required) and afternoon happy hour bars will open at 3:30 pm (cash, credit and drink tickets accepted). So stop by, refuel, and network with the leading industry associations co-exhibiting with TCNA: the Ceramic Tile Distributors Association (CTDA), the International Masonry Institute (IMI), the National Tile Contractors Association (NTCA), the Tile Contractors Association of America (TCAA), and the Tile Heritage Foundation (THF). TCNA’s Lab Services team will be on hand as well to discuss the research and testing offered at its state-of-the-art Product Performance Testing Laboratory – North America’s largest tile-and-stone-specific facility for independent testing and research. Discounts on TCNA literature will be available for those of you looking to round out your technical library. Catch these info-packed 20-minute mini-sessions (running Tuesday through Thursday) on the inherent benefits tile has to offer: Do You Know What’s in Your Floor Covering? Durability: How Do Other Floor Coverings Measure Up? The Value of Tile (from a Top Realtor’s Perspective). Check the Coverings app or Show Directory for times and locations. 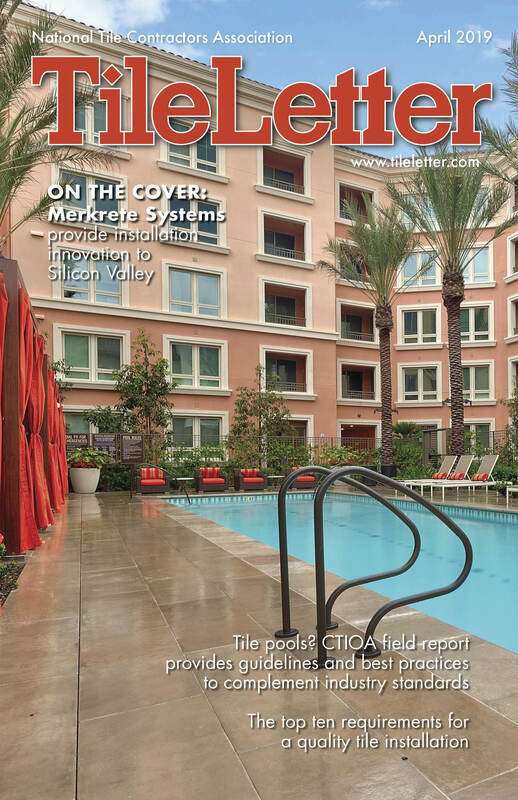 TCNA and TCNA members are synonymous with leadership in building green with tile. The industry-wide, UL-certified Environmental Product Declarations (EPDs) for tile, tile mortars and tile grouts made in North America provide unprecedented transparency on the environmental impact of a full tile installation, making it easier for green builders, designers and specifiers to make informed decisions that satisfy the requirements in top green building rating systems including LEED, Green Globes, IgCC, ASHRAE 189.1 and ICC 700. Those seeking LEED building certification can also look to Green Squared Certified® products, which contribute toward the LEED Pilot Credit, for “Certified Multi-attribute Products and Materials.” For the latest on tile sustainability, be sure to catch Bill Griese, TCNA’s Director of Standards Development and Sustainability Initiatives, in the panel session “Health, Safety, Environment, Design: Specifying Tile in Today’s Sustainability Landscape” (Wednesday at 8:00 am). Looking for the newest installation materials, technologies and tools on the market? The North American pavilion is where you’ll find them. 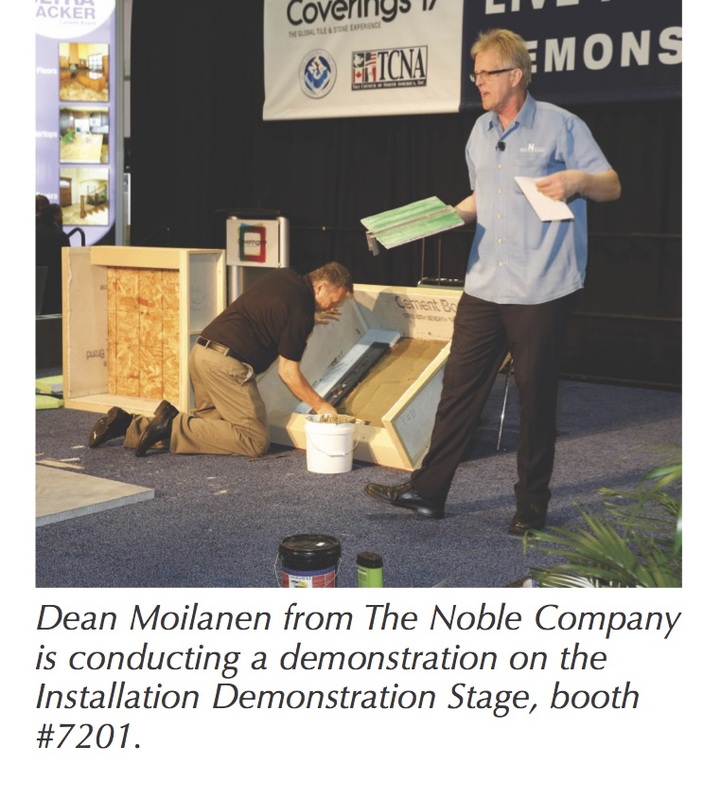 Throughout the show, TCNA exhibitors and the National Tile Contractors Association (NTCA) will provide live product demos at the Coverings Installation Demonstration Stage (#7201). Get an up-close look at the latest products in action, and tips from the pros on how to navigate common challenges. While you’re there, enter to win one of the free drawings between demonstrations. 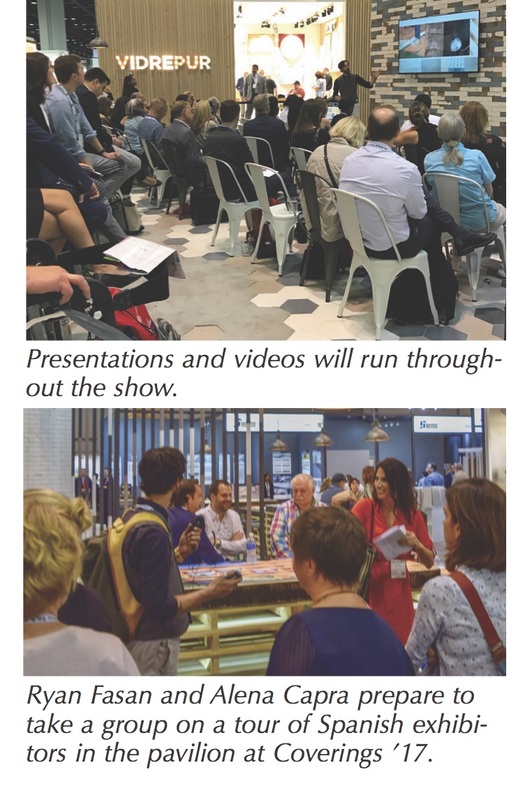 New in 2018 – Don’t miss the Installation Experience (#8401) where master installers and technical experts from top industry associations – CTEF, IMI, International Union of Bricklayers (IUBAC), NTCA, TCAA and TCNA – will show shining examples of proper installations for various applications throughout the home (see page 46, for details). 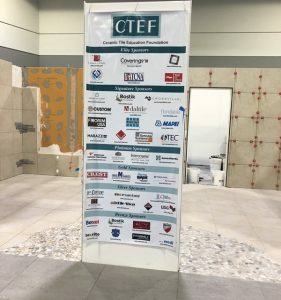 CTEF will be onsite with information for contractors and installers looking to advance their careers through the Advanced Certifications for Tile Installers (ACT) and Certified Tile Installer (CTI) programs. Guided tours of the Installation Materials District leave from the Contractor and Dealer Lounge (#8201) at 11:00 am on Wednesday and Thursday with roundtable luncheons to follow. 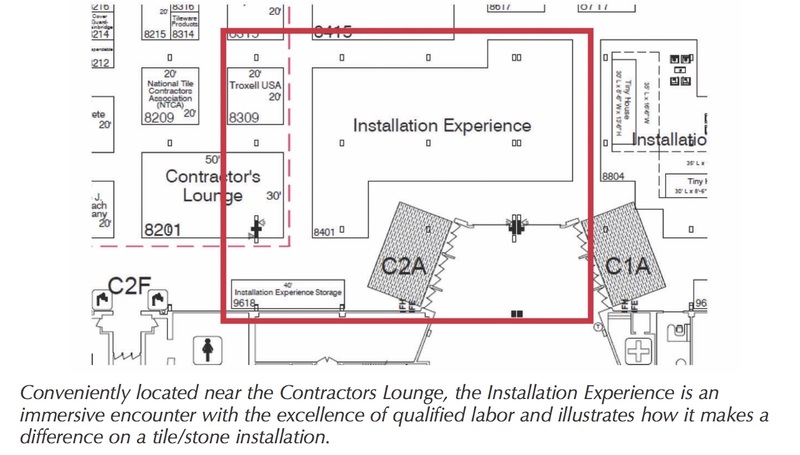 Badged contractors and installers can visit the lounge to reserve a spot while they’re still available. Exclusive Happy Hours begin Wednesday and Thursday at 3:00 pm. Explore beautiful and unique offerings from boutique tile makers across the continent in the Art Tile Village – the largest assembly of decorative tile artisans under one roof! 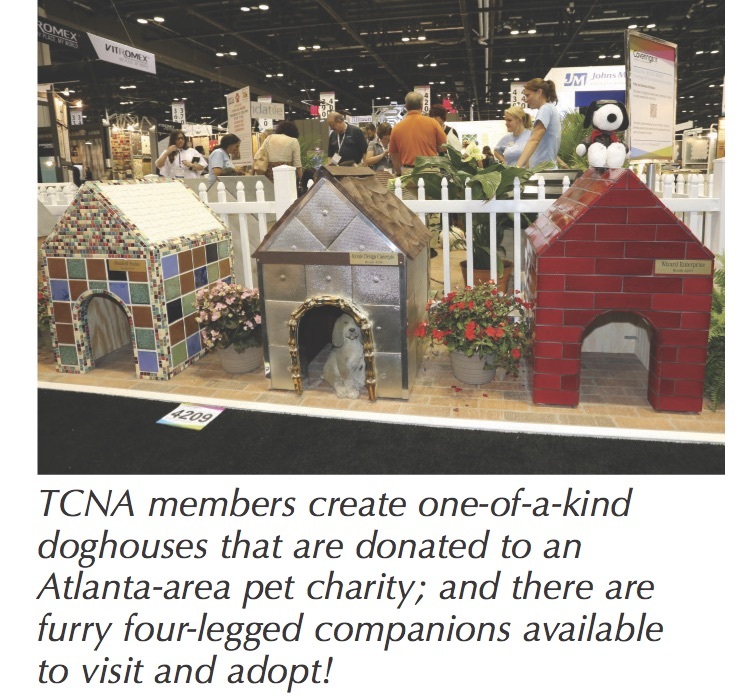 Displayed in the courtyard (#7249) you’ll see one-of-a-kind tiled dog houses created by TCNA members. The artful abodes will be donated to an Atlanta-area pet charity, which will be onsite during the show with some furry, four-legged companions. Be sure to stop by – you may just make a new friend! 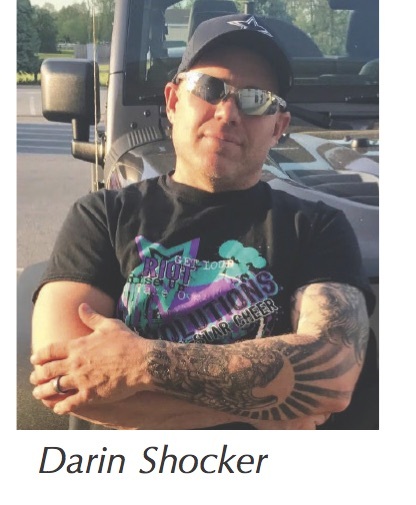 Darin Shocker, owner of Dutchess County Tile, who recently was recruited by a setting materials manufacturer as a New York-area rep for his integrity and knowledge, tells a fascinating story of his journey through the tile trade and his hope for the industry’s future. Shocker started working for a local bathroom remodeler/tile setter when he was 16. Although, in Shocker’s words, his boss was a “hack and a crook; he took advantage of everyone he could,” and “even at 16, I could see how bad his work was,” Shocker discovered a love of ripping out bathrooms and being a helper! 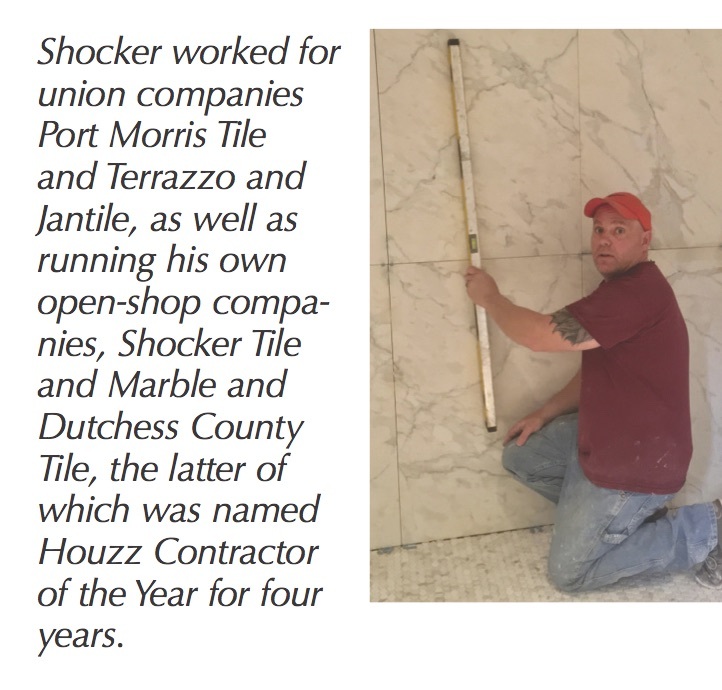 Shocker worked with him through high school, and shunned scholarships to play sports in college because he had gotten what he considered a better opportunity: an offer to be “a tile setter apprentice for the biggest union company in NYC: Port Morris Tile and Terrazzo,” he said. Shocker worked for Port Morris for eight years. This huge company with hundreds of employees gave him the chance to work on all types of projects from building exteriors, malls, lobbies, and swimming pools to luxurious hotels like The Essex House and the Ritz Carlton. About this time though, work started to get tight and he was out of a job. 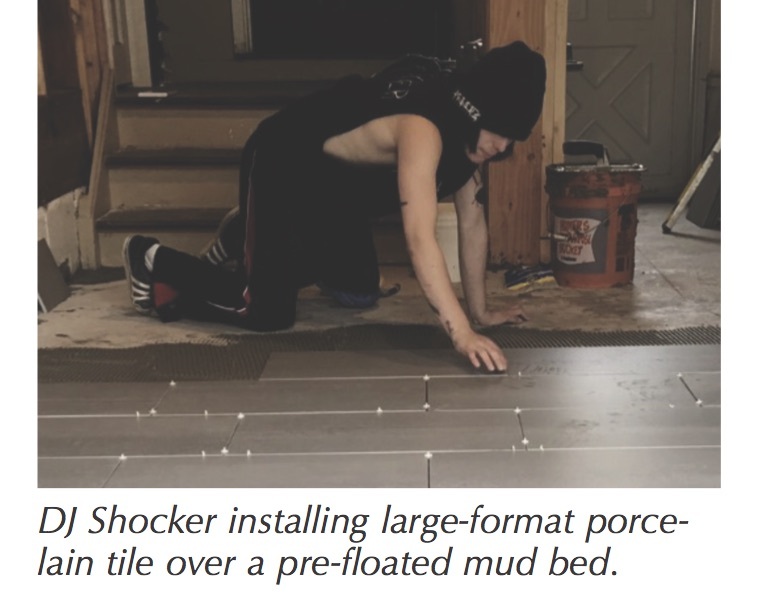 After three months, Shocker went out on his own looking for work – knocking on doors of new home builders and going into local tile stores with pictures of his projects. Soon, tile stores sought him out as a good, honest setter they could refer to customers. “Then one day I got my first big break – a small contractor for whom I worked got hired by the folks who invented caller ID,” he said. “They bought an old IBM building in Valhalla, N.Y. for their headquarters. He hired me to do four lobbies, a ton of bathrooms and a big cafeteria. I couldn’t do this with the small crew I had, so I reached out to all my old foremen and good setters and finishers I had met in the union who were still out of work to give me a hand.” This job put his company Shocker Tile and Marble on the map, which had a great run and developed an excellent reputation for doing outstanding work. Enter the recession in 2007, which decimated work all over the country. Shocker went back to his union roots and called Port Morris Tile and Terrazzo, and the new big guy on the block, Jantile, Inc. Owner Anthony Casola hired Shocker the day he called, and he worked there for four years until city work evaporated. 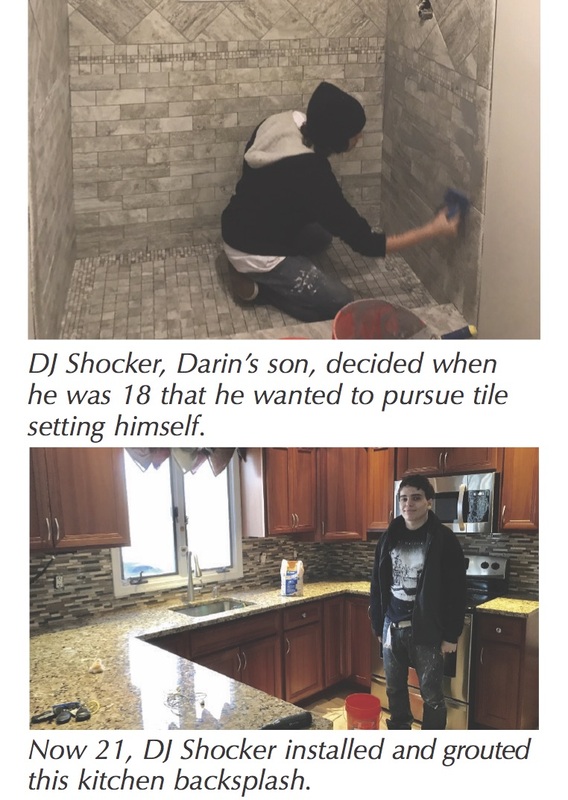 Ever resourceful, Shocker switched gears to take advantage of the wave of residential projects as his own company, Dutchess County Tile. His goal for his small company was to do high-end jobs, one at a time. The elder Shocker said he was “pretty much installing tile the same way over and over again because of past success. I wasn’t really keeping up with the newer methods. I wanted to teach my son the old-school ways but knew I better get myself educated with the new school ways so I could teach them to him as well. The National Tile Contractor’s Association (NTCA) has a full menu of activities, programs and features planned for Coverings ’18. Visit NTCA at booth #8209 or #7832 where it is co-exhibiting with TCNA, CTDA, THF, IMI and TCAA. Installation Experience, Hall C Booth#8401: A highlight of NTCA’s activities at Coverings is the brand new Installation Experience. The Installation Experience allows Coverings show attendees to experience numerous types of tile installations implemented by master installers and technical experts from top industry associations –CTEF, IMI, International Union of Bricklayers (IUBAC), NTCA, TCAA and TCNA. These live, interactive sessions will showcase today’s best practices relative to a multitude of distinctive tile installations in a fully functioning kitchen, a bathroom with heated tile floor, vintage fireplace upgrade and grand installation of a contemporary shower system. These state-of-the-art projects will involve glass tile, porcelain, gauged porcelain panels, natural stone and other cutting-edge tile products and breakthrough technology installation systems. Entering via a self-guided, designated pathway, guest/participants will journey through room after room of fully interactive installations with top representatives posted along the way to answer any and all questions. They’ll have the opportunity to speak with industry experts regarding key processes, learning new strategies and experiencing hands-on demonstrations of the most modern of technologies. Other highlights include photographic retrospectives in the Hall of Failures and the Hall of Excellence that show the difference between the right way and wrong way to perform a tile installation. In the Hall of ACT (Advanced Certifications for Tile Installers), ACT representatives will be available to discuss the program with attendees. Part of the Installation Experience includes the Construction Zone, where visitors can experience the progression of the CTI (Certified Tile Installer) Challenge. The CTI Challenge is an exciting, live event designed by CTEF Director Scott Carothers, which pits rival teams of NTCA members who are Certified Tile Installers in a “Fight of the Century” for the best installation. 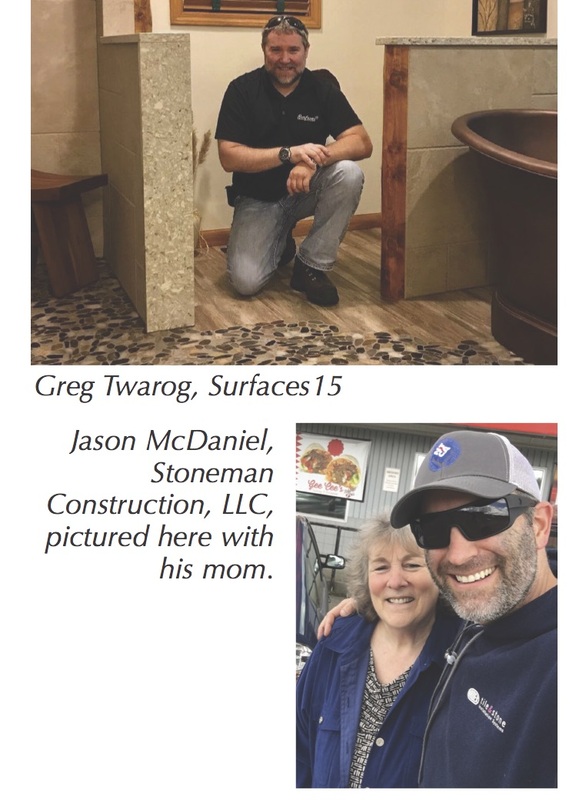 Jason McDaniel, a 2018 Rock Star and owner of Stoneman Construction LLC in Lake Oswego, Oregon, and Greg Twarog of Surfaces15, in Downers Grove, Ill., head up the teams of contenders for this good-natured competition. Representatives will be onsite to define, discuss, and demonstrate just what it takes to be a part of the elite group of qualified labor that includes the CTI program and the ultimate group of installers who have achieved the status of being ACT certified. The Installation Experience will conclude with At Home, with Tile. This final installation area features an expansive seating area and large TV screen showing time-lapsed progress video, highlighting the various construction stages of the various projects slated to take place. 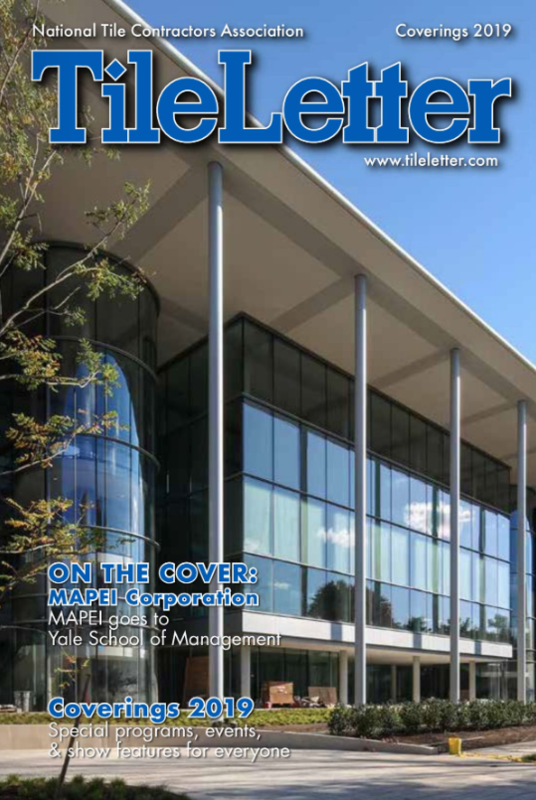 Don’t miss this amazing new Coverings feature that has something for everyone. Your Coverings experience will be incomplete without it. 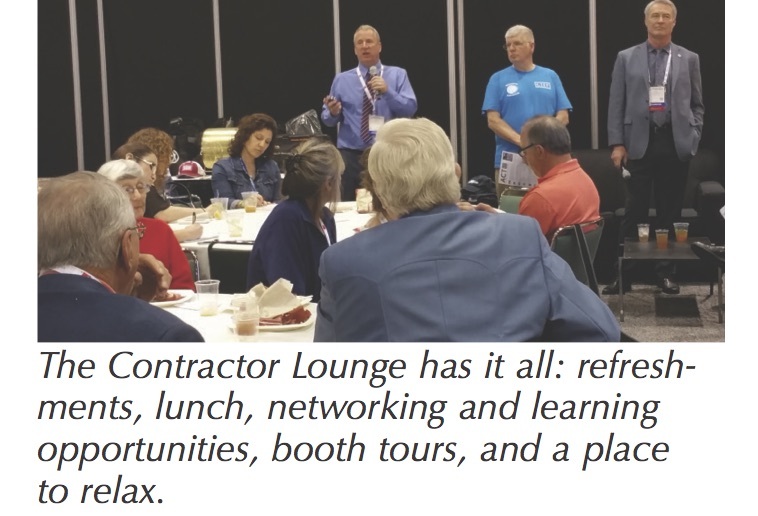 Contractor and Dealer Lounge Booth #8201, Tours, and Contractor Days events: You’ll find the Contractor & Dealer Lounge in booth 8201, where you can regroup, network, and participate in short presentations and roundtable discussions throughout the week. Sponsored lunches and giveaways, and a guided contractor tour will take place on Wednesday and Thursday at 11 a.m., the official Contractor Days. Sign up for the tours in the lounge; and circle back at 3 p.m. to kick back during Happy Hour. 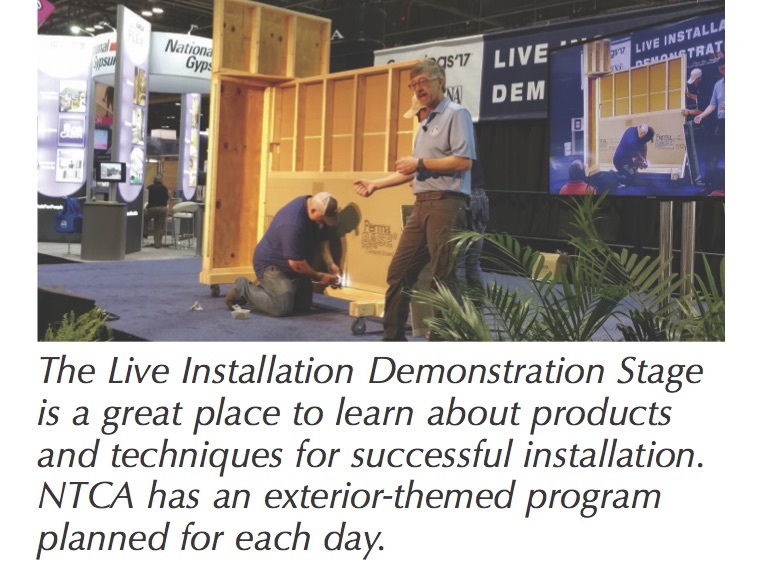 Live Installation Demonstration Stage: NTCA trainers/presenters Robb Roderick and Luis Bautista have arranged a full schedule of exterior-installation-themed demos at booth #7201 that focus on industry standards, methods, and best practices for successful tile installations in the great outdoors. Three “episodes” will be repeated twice on a rolling schedule from Tuesday -Thursday, with a recap of highlights on Friday morning. Red Team: Jeffrey Bruce Baker Designs paired with D.W. Sanders Tile & Stone, with tile and stone supplied by Florim, and setting materials from LATICRETE. Blue Team: Johnson Studio/Cooper Carry paired with Visalia Ceramic Tile, with tile and stone supplied by Ceramic of Italy and installation materials from MAPEI. Green Team: Carson Guest partners with J& R Tile, with tile and stone supplied by Crossville, Inc., and installation materials by ARDEX. Member benefit questions answered: If you’ve been wondering if the benefits of NTCA are for you, stop by NTCA booth #8209 during the show to talk with representatives who will be able to answer your questions about the full range of member benefits and member-only opportunities. 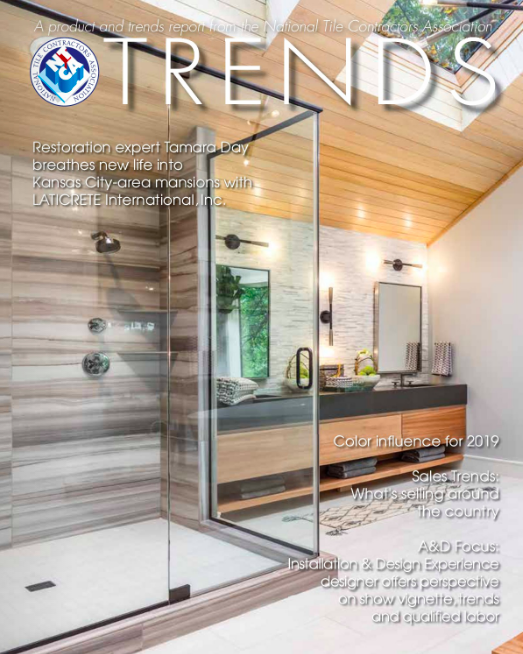 Coverings Installation Design (CID)Awards – Hosted by TileLetter, Contemporary Stone & Tile Design and Tile Magazine, this awards ceremony recognizes outstanding designers and installers of tile and stone projects at home and around the world. It takes place Wednesday, May 9, 5:30 -6:30 p.m. in room B401. 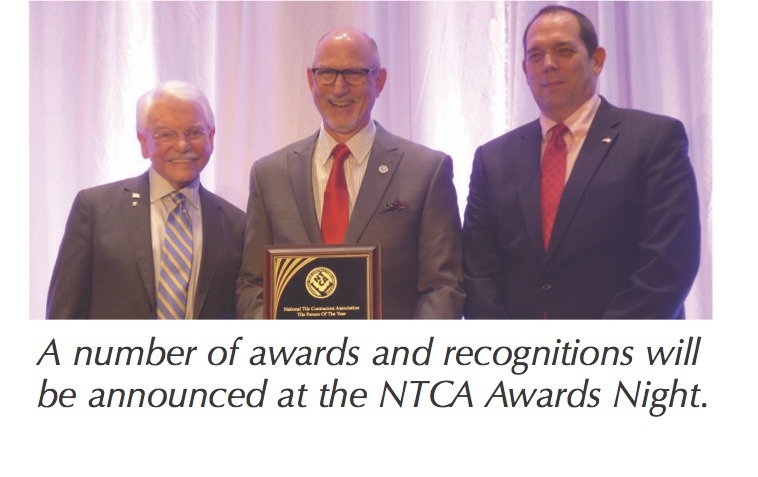 The Tile Council of North America, a sponsor of the Awards Program, will also honor a deserving individual with its Service to the Industry award. 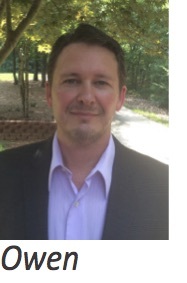 Highlighting the event, the NTCA 2017 Tile Person of the Year Award will be presented to Christopher Walker, Vice President of the David Allen Company. Chris has logged more than 32 years as a professional manager and installer in the tile Industry and has successfully managed the successful installation of millions of feet of commercial projects. A recognized industry expert, Chris also serves the industry as 1st Vice President of the National Tile Contractors Association, Chairman of the American National Standards Institute A-108 Committee, Chairman of the US Technical Advisory Group for ISO T-189, Board of Directors – Associated Builders & Contractor (ABC) of Virginia, as well as having been a voting member of the NTCA and TCNA Handbook and Technical Committees for many years. Visit the TileLetter and National Tile Contractors Association pages on Facebook for ongoing live updates from the show.